First, my thanks to IVP for a review copy of Alister McGrath's Doubting. Click here for the table of contents and an excerpt. Second, thanks to Nelson Moore for the following. As you will realize by reading his superb offering below, Nelson has a very sharp mind and he is not afraid to say what he honestly thinks. Plus it made me laugh. Prepare for a tremendous review ... Hang on, this sounds like I'm reviewing a review! I'll stop now. The book at hand was originally published by IVP in 1990 under the title Doubt. Its current edition, entitled Doubting, first appeared in 2006. It is written not for an academic audience, but rather on a popular level, having originally been created as a series of talks to a group of university-aged people. Because of this, I do not recommend this book for those who are trained in theology or philosophy. You will be disappointed by its thin content in many areas. The book is divided into eleven chapters, each of which attempts to deal with some element of the overall discussion. For example, chapter one attempts to define the terms "faith" and "doubt" while chapter two discusses what McGrath calls "the vain search for certainty." The list goes on (doubts about Jesus, doubts about the Gospel, etc.) as McGrath tries to provide a cursory treatment of a variety of matters relating the doubt and faith. McGrath does deal capably with some items. He responds quite helpfully in chapter one, for example, to the notion that faith should be defined basically as the absence of doubt. In this model, one begins with doubt and as soon as every single doubt has been overcome, then the residue is called faith. McGrath rejects this model, viewing faith as more of a "saying 'yes'" to the call of God – a call to which people respond despite the fact that do not have the answer to every objection. He also does a very good job in chapter two supporting the claim that no side in the debate over the existence of God is going to have absolute certainty. He is quite clear that faith in Jesus is ultimately going to require a leap (p. 25) in which you choose to believe and follow. Take heart, however, because your ideological opponents also need to make a leap in order to arrive at the conclusion that no God exists. In some of his later chapters, he does a good job of using biblical narrative in a pastoral manner, drawing upon the Exodus narrative and subsequent wilderness wanderings, for example, to illustrate the need for persevering faith. There are plenty of instances in which he engages the biblical material in this way. These later chapters also contain simple, practical advice. Read the Bible, pray, join a community of faith so that you are not alone in your spiritual walk. I certainly do want to endorse his counsel on these matters. I also found myself a bit disappointed by the thin treatment of philosophy. It seems odd to have a book that talks about faith as a leap without ever discussing Kierkegaard. And while Ravi Zacharias mentions Descartes in the foreword, I do not believe that McGrath ever discusses the French philosopher in the context of doubting what cannot be proven. Does it really make sense to write a book that is self-describedly geared toward university students and then never cite the philosophers whose insights you are using? The exegete in me finds the book quite thin when it comes to actual biblical exegetical work. I know it's written for a lay audience, but I don't think it's wise to write a book in which you define the word "faith" without doing some pretty hefty exegetical work. And finally, some of the statements McGrath makes are just plain silly. I will provide the most egregious two examples. Chapter two is entitled "Doubt and the Vain Search for Certainty." While the chapter ultimately proved to be quite good, I cannot help but comment on the following passage. "Absolute certainty is actually reserved for a very small class of beliefs – for example, things that are self-evident or capable of being logically demonstrated by propositions. Christianity does not concern logical propositions or self-evident truths, such as 2+2=4, or 'the whole is greater than the part.' Both of these are certainly true, and we are able to know such truths with absolute certainty – but what is their relevance to life? Realizing that 'the whole is greater than the part' isn't going to turn your life inside out! Knowing that two and two equal four isn't going to tell you anything much about the meaning of life. It won't excite you. Frankly, the sort of things that you can know with absolute certainty are actually not that important" (23). I am trying to imagine McGrath's response if his pharmacist were not altogether concerned about 2+2=4 when dispensing life-saving medication. Or perhaps the pharmacist might counsel a patient to swallow the whole bottle of pills since it doesn't really matter that the whole is greater than the part. That a trained scientist and theologian would make such an absurd statement is nothing short of stunning. In chapter eight on "Doubts about Jesus Christ," he brings up the question of whether or not the resurrection might have been some sort of cover-up. He writes, "Doubts about the resurrection arise from suggestions – along with the deep-down feel of some Christians – that the resurrection is just too good to be true!" Such a statement is so ridiculous I can barely respond to it. I think people doubt the resurrection because it is difficult to believe! Now I do believe in the resurrection, but I think we need to engage skeptics sincerely, not with ridiculous platitudes. In my own spiritual and intellectual life, I definitely find myself beset with doubt. "What if this whole Christianity thing really is just kind of a pre-modern folklore that arose to fill a psychological need?" "What if I leave behind other business opportunities to enter ministry, only to learn down the road a bit that the whole thing is a fraud?" "What if Dawkins is right?" "What if Mohammed is right?" These are very legitimate questions and I have been beset at times with every one of them. And it is clear to me that Alister McGrath also takes them seriously. I just wish he did a better, more thorough job of answering them. If you are well educated regarding Christian life and thought, I suspect that you will want to skip this book. And if you are trained in philosophy, you will definitely want to skip it. But if you are more of an "average" person who is exploring the world of faith and doubting, then you may well find some encouragement from Alister McGrath's Doubting. A short while ago professor of astrophysics Øystein Elgarøy was a profiled liberal Christian who defended his faith in articles and at debates. But... this year [I, Elgaroy] heard a debate between the atheist Christopher Hitchens and the theologian Alister McGrath. – Suddenly I realized that it was much easier to agree with Hitchens than with McGrath. This realization had matured within me for quite a while. My disappointment over the book "The Dawkins Delusion" by the same McGrath was one of the factors. – I read McGrath's book hoping to find some good answers to the challenges from Dawkins, but... While reading it struck me "is this really the best answer a theologian can come up with?" It was a surprisingly weak answer in many ways, says Elgarøy. I retain a profound respect for [atheism’s] aspirations for humanity and legitimate criticisms of dysfunctional religion... There is something about human nature which makes it capable of being inspired by what it believes to be right to do both wonderful and appalling things. Neither atheism nor religion may be at fault. Didn't Xnty grow due to believers strongly urging the necessity of belief? Check out the O.T. prophets' display of faith via praying down "fire from heaven," or check out the "you must have faith" motif in the Gospels, or check out the "believing without seeing" motif in the fourth Gospel, or verses like "He who does not believe is damned" in the added last chapter of Mark, or the verse in the Fourth Gospel, "He who does not believe is damned already." Theologians who admit the value of questioning and who admit that they have "doubts" are inspiring Xns to grow more moderate, more liberal, and thus going AGAINST the stream of Xn teaching above. And does McGrath explain why people must choose to believe exactly what lay behind the metaphysical curtain? It's a curtain. 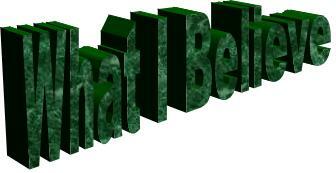 Your beliefs about what lay behind it can lie along a whole spectrum of varying probabilities throughout your life. Go to church on Sunday, go to atheist coffee house meetings on Monday, go to Buddhist meditation meetings on Tuesday. in one particular book and interpreted via a particular creedal system." When I first read this book I was in a place of serious doubt. I read online that this book was a good read for people in doubt and respecting McGrath already for other works, I thought it would be a good read. The first section truly ministered to me. Whenever McGrath discussed the purpose and meaning of doubt I could see exactly what I was going through and the book did a good job of addressing the need I had. Whenever McGrath got into addressing objections and dealing with the particular issues people struggle with, the book fell apart. It's not that McGrath didn't offer good arguments or doesn't have the ability to address these issues, it's just that he didn't do it in this book. Since the book is aimed at an "average" audience as the end of this review suggests, McGrath strays from going too far in depth. A solution would have been to be more up front about the lack of depth in the book, and offer a greater bibliography at the end, but McGrath didn't do this either. McGrath has a great mind, and has been a blessing to evangeilcalism in many ways. He has done some outstanding work in the past in apologetics, but this book is not worth reading if you are truly looking for apologetical answers. On the other hand, if you are struggling with doubt and are more interested not in arguments against your doubts, but answers as to why you are doubting, what the doubts mean, and if these are struggles that other Christians have faced, then this might be a good read for you. this video debate in which McGrath was involved, as seen on Channel 4's "The trouble with atheism," a debate between Alister McGrath and Peter Atkins, 22nd Mar 2007. Peter Atkins is a Professor of Chemistry at Oxford University, well-known atheist and supporter of Richard Dawkins. Personally speaking, I've known about McGrath's apologetics for a while. I sent him an email a while back documenting that he was wrong in his biography about John Calvin for having complained about the agnostic Aldous Huxley's not provided a reference concerning the incident of a child having been executed in Calvin's Geneva for striking his parents. It turns out McGrath was simply unfamiliar with works prior to Huxley's that mentioned this incident, including Schaff's History of Christianity. I even found references to children being hung by their arms in gallows in Geneva to show the public that they "deserved execution," and other children being threatened with execution for playing games on Sunday, but the cooler-headed leaders of the town disagreed with the clergy that the children ought to be executed. ...soon followed by several works by atheists like Dennett, Dawkins, Harris and Hitchens, that turned out to be bestsellers the likes of which atheist book sales had never seen before. This fall several universities in the U.S. will also be forming their very first "campus freethough alliance" organizations. And anyone checking "meetups.com" also can't help noting that atheist organizations are being formed simply as coffee house meeting groups in different cities round the U.S. Sorry, didn't mean to hog the topical replies. My "McWrath" has now been appeased on this topic, and I shall say no more. "Meanwile, places where Christianity is growing like in Africa and China are also seeing the growth of other types of religions, including of course weird variations of Christianity itself, end times sects, and superstitious miracle-mongering sects." I can not speak for Africa, but as someone who lives in China, and can see what's actually happening, let me assure you that the content of this quote is simply not the case and shows clear ignorance of the topic. The two main religions that are rapidly growing in China are Christianity and folk-Buddhism. Atheism is declining, and some would say that traditional Taoism is as well (although it remains popular as a philosophy and heavily influences culture in the cities). In the villages the people have rapidly returned to their ancestral forms of Buddhism (Chinese traditional worship is a variation of Mahayana Buddhism). Christianity is currently having little impact in the villages, and atheism is declining as it is no longer enforced by the government. In the cities (primarily among the 20-40 crowd), Christianity is rapidly replacing atheism as the religion of choice. It's very common for students to become involved in church because of the prompting of their university professors. As such, it is seen as the "educated" religion by many and is rejected at times by "uneducated" parents. Whereas only around 100-120 million Chinese are Christians (10%), the percentage among 20-40 year olds is much higher. Furthermore, considering that well under 1% of Chinese were Christian just forty years ago, you can see that the conversion from atheism has been rapid since China opened back up in the 80s and 90s. Atheism continues to decline for two main reasons. First, it is seen as a religion that offers too limited a perspective in regards to how people actually view life. Second, many now associate it as part of what led to the power hungry political violence of the 60s and 70s (the mass killings and imprisonments of religious leaders and activists). Whereas arguing that religion leads to violence works against Christianity in places like America, in China they know that violence (even genocide) in the name of atheism is just as possible. Because of past conversations on this blog, that a local Christian leader (in the house church movement) is also professor of evolutionary biology at the national university in town. Many of his friends in the biology department are also believers, and his English name is Darwin, haha. They see no conflict between evolution and Christianity. Finally Ed, you make the claim that Christian cults are rapidly growing here. That's simply not true. Sure, they have followers, but "rapidly" doesn't describe their growth. The largest Christian cult is known as Eastern Lightning. It claims that Jesus returned as a woman who lives out in the forest. They are known for their strange conversion tactics (look them up if you're interested). Still, it only has a few hundred thousand followers (which is very small for any group in China). I'm sorry for that last comment. Since it has no relevance to the original post, but is only in response to information that Ed posted, please feel free to delete it at your discretion (although I guess you have the right to do that anyways since it is your blog after all, haha). My experience with Alister McGrath is that he is much better when writing at a more "academic" level than when writing at a "popular" level. For example, I remember his book on "Reformation Thought" being excellent. Similarly, while "Dawkins' God" was not an academic work, by all accounts it is much better than the (even more) popular-level "Dawkins Delusion". And listening to McGrath debate Dawkins (on the Times website last year) was just plain embarrassing. As for the age at which McGrath ceased to be an atheist: I don't see why that disqualifies him from comment. Teenagers can be as rottweiler-ish as anyone, and one of the key criticisms that can be made of Dawkins in The God Delusion and his other writings on religion is that (in contrast to his superb writing on science) he has barely advanced beyond a teenager's understanding and attitude when it comes to Christianity. Finally, as regards the "Twilight of Atheism", that does indeed look as premature as Arnold's "long, withdrawing roar" of the Sea of Faith. However, it can be argued that fundamentalism is generally a reaction against a perceived broader loss of cultural influence - almost a form of denial; or perhaps akin to the process by which dying stars start to undergo fusion with new elements in an increasingly frantic process which ends with them exploding. The old truths are reasserted with greater vehemence than ever, as a means of comforting "believers" and resisting the encroachments of other worldviews. This could be as true for "atheist fundamentalism" as for "Christian fundamentalism" or "Islamic fundamentalism". A well-rounded presentation of the Bible's view on faith would also have to include the wisdom literature with its doubts, questions, challenges, towards God. I often use the Psalms, and have encouraged others, as prototypes in how to openly express doubts to God. Also why bring up a Norwegian astrophysicist? I'm guessing you were particularly enthused about Elgarøy's conversion and couldn't refrain from us with it? I can't see any direct correlation with the topic. Why don't I go around spamming about Frank Tiplar the atheist quantum physicist who converted to Christianity a year or two ago because of his research? I have not yet read this book, though I bought it about a month ago and look forward to the reading (no less so after Babs' rants and the reasoned criticisms of Chris and the other commenters here). A pre-read question of my own. Isn't this book targeting Christians who are in the throes of faith crises themselves? And as such, wouldn't forays into philosophy, and even into the value of healthy doubt, be somewhat superfluous? I agree with Chris that any full-ranging discussion of doubt should include these; but does the individual who is struggling with his own personal convictions need to be lectured on the value of healthy doubt? Ranger, your comments are always welcome. Dan, you make some great points - Edward, you should read his comment. I just wanted to note that I didn't write the review - Nelson Moore did! Well, after reading your opening paragraph again, I do see that you didn't write the review. Perhaps that also would explain the title of post (if I had bothered to read it!). Sorry. No problem, Cliff! I just didn't want to take credit for the post! I think I am going to read this, perhaps it will help me on my spiritual journey.